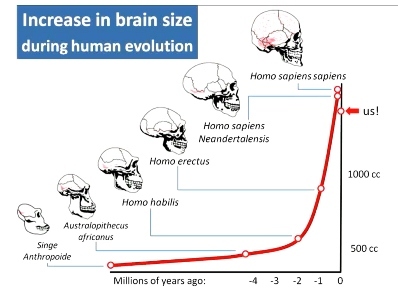 Humans have the largest brains of any primate in absolute terms, as well as relative to body size. Brain size varies with body size - larger bodied species tend to have larger brains, but not always. 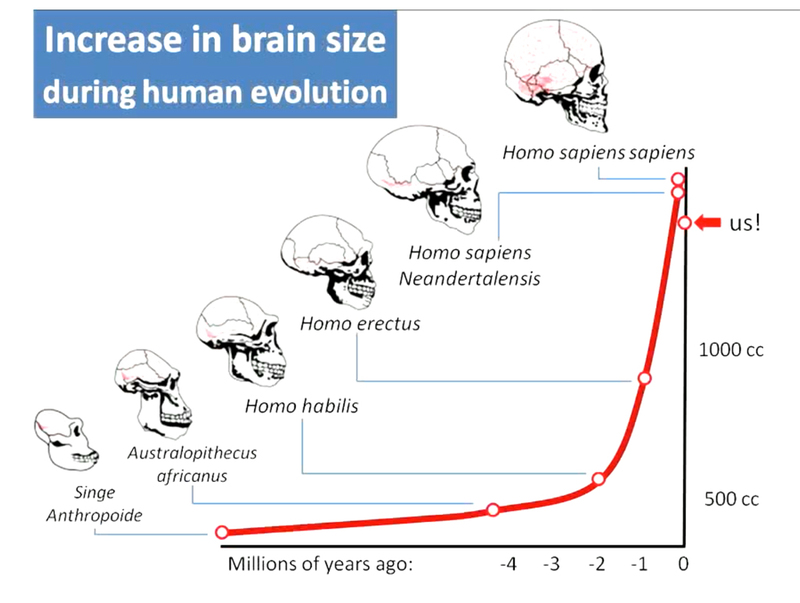 The evolutionary increase in brain size in our ancestral line, subsequent to the split between humans and chimpanzees, is well documented in the fossil record. The greatest increase happened in the genus Homo in the last 2 million years (Pleistocene) . Human encephalisation is not an obvious choice for the evolution of any species. The human brain consumes a great deal of the body's energy and our ancestors would have had to have had the nutritional means to make this possible, with a reliable, all year round available food source, rich in brain specific nutrients. Aquatic diets contain plenty of Omega 3 and DHA (docosahexaenoic acid), which is very important for the brain growth and development, as well as essential for proper neurological functions and mental health. In his book: "Survival of the Fattest: The Key to Human Brain Evolution", Professor Stephen Cunnane notes that brain growth requires nutrients, vitamins, and minerals such as iodine, iron, copper, zinc, selenium, and the long-chain polyunsaturated fatty acid, DHA in higher quantities to support encephalisation. Maritime food such as shellfish and crayfish are among the rare naturally occurring foods enriched with these nutrients which suggests that homo's enchaphilisation was triggered by arrival at the shoreline. Survival of the fattest: the key to human brain evolution. Brain-specific lipids from marine, lacustrine, or terrestrial food resources: potential impact on early African Homo sapiens. Rift Valley lake fish and shellfish provided brain-specific nutrition for early Homo. Evidence for the unique function of docosahexaenoic acid during the evolution of the modern hominid brain. The early development and evolution of the human brain. The role of docosahexaenoic and the marine food web as determinants of evolution and hominid brain development: the challenge for human sustainability. 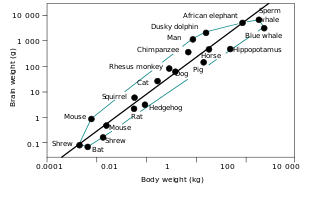 Docosahexaenoic acid in neural signaling systems. Roles of unsaturated fatty acids (especially omega-3 fatty acids) in the brain at various ages and during ageing. Broadhurst CL, Wang Y, Crawford MA, Cunnane SC, Parkington JE, Schmidt WF. Broadhurst CL, Cunnane SC, Crawford MA. Crawford , Bloom M, Broadhurst CL, Schmidt WF, Cunnane SC, Galli C, Gehbremeskel K, Linseisen F, Lloyd-Smith J, Parkington J. The brain and nervous system is characterised by a heavy investment in lipid chemistry which accounts for up to 60% of its structural material. In the different mammalian species so far studied, only the 20 and 22 carbon chain length polyenoic fatty acids were present and the balance of the n-3 to n-6 fatty acids was consistently 1:1. The difference observed between species, was not in the chemistry but in the extent to which the brain is developed. This paper discusses the possibility that essential fatty acids may have played a part in it evolution. The first phase of the planet's existence indulged in high temperature reactions in which oxygen combined with everything feasible: from silicon to make rocks to hydrogen to make water. Once the planet's temperature dropped to a point at which water could condense on the surface allowing chemical reactions to take place in it. The atmosphere was at that time devoid of oxygen so life evolved in a reducing atmosphere. Oxygen was liberated by photolysis of water and as a by-product of the blue-green algae through photosynthesis. When the point was reached at which oxidative metabolism became thermodynamically possible, animal life evolved with all the principle phyla establishing themselves within a relatively short space of geological time. (Bernal 1973). DHA and nerve cell membranes DHA AND NERVE CELL MEMBRANES: From the chemistry of contemporary algae it is likely that animal life evolved in an n-3 rich environment although not exclusively so as smaller amounts of n-6 fatty acids would have been present. A key feature of the first animals was the evolution of the photoreceptor: in examples of marine, amphibian and modern mammalian species, it has been found to use docosahexaenoic acid (DHA) as the principle membrane fatty acid in the phosphoglycerides. It is likely that the first animals did so as well. Coincidentally, the synaptic membranes involved in signal transduction also use high proportions of n-3 fatty acids. However, the n-6 fatty acids also find a place, in the inositol phosphoglyceride (IPG) which appears to be involved with calcium ion transport and hence signal activation and reception. Even in the photoreceptor, the IPG is an arachidonic acid rich phosphoglyceride.